When looking for properties to invest in, this is the most critical step, but surprisingly the most overlooked. Failure to do so can mean average returns or worse, a dead investment. It’s important you not only look at the city your investing in but also research on aspects like the builder’s history, upcoming projects in the area, civic amenities, the location’s capital appreciation, rental yield, resale value, etc. Every bit of research you do or don’t can affect the returns you make on your investment. Many people often rush into their investments without fully evaluating their finances. While investing in a property, you tend to overlook the additional costs of painting, maintaining, furnishing and monthly living expenditure. Apart from this, you also have property tax, home insurance and duties payable while buying a home. Making a list of all these expenses will help you make a better decision on whether you can afford a particular property or not and save you from potential debt. Another important financial aspect is the home loan and your CIBIL score plays a huge role in ensuring your home loan does not get rejected. A CIBIL or credit score reflects the complete history of all past loans and credit card bills. A score of 750 and above shows that you make payments on time and increases your credibility and ability to get a loan. Many people believe that taking on a home loan solves their financial problems. However, it is imperative you clear out your credit history before you think of approaching the bank. Most investors don’t have a clear plan or strategy in place to analyse their cash flow projection and budget before investing. Ideally, your investment process must start with setting a tangible goal – what is the desired outcome of your investment. Different people have different requirements depending on their age, income level and experience. For example, someone in their retirement or close to it would prefer a steady cash flow, whereas someone younger might be more adventurous and might want to grow his equity through a growth-oriented strategy. By figuring out which category you fall under, you can avoid some real estate investing pitfalls. Start out by educating yourself on India’s real estate market – find out which localities are currently real estate hot spots with guaranteed appreciation rates. For instance, Chennai’s outskirts are seeing tremendous growth because of the concentration of IT Parks and offices. There are several real estate options for us to invest in – from houses and villas to commercial and industrial spaces. To maximise returns, make sure you do decide between residential and commercial real estate as a better investment option. It is also important you check out the amenities and facilities offered by the developers as they play a huge role in your day-to-day life. Look for state-of-the-art architecture and world-class quality of construction, making it the best investment option for NRI investors and resident home buyers. When it comes to investing in real estate, it is always advisable to opt for a reputed property developer. Apart from global amenities and facilities, coupled with high-quality construction and mind-blowing design, a reputed builder will also ensure that the development has received all the approvals and permits required for hassle-free handovers. They also ensure the projects are RERA certified for transparency in transactions. Casagrand is one of the leading property developers with remarkable properties in the top cities of Chennai, Coimbatore and Bangalore. We create stunning living spaces that complement urban living. 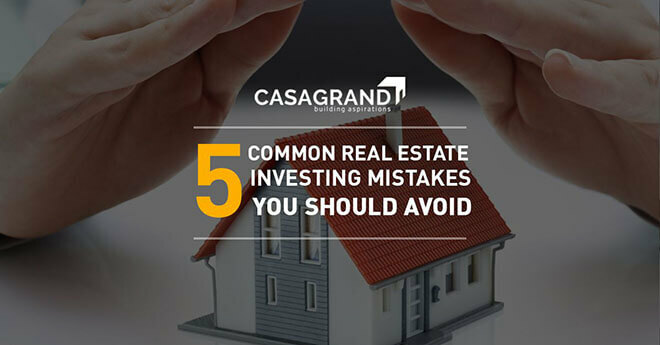 Whether you’re a first time home buyer or seasoned investor, revisiting the basics and understanding these common mistakes can help you save time and money. Once you’re prepared, head out to Casagrand today and find your dream home.